Bu çalışmanın amacı öğretmenlerin çevrimiçi bilgi arama stratejilerini cinsiyet, günlük internet kullanımı ve bilgi arama deneyimi açılarından incelemektir. Çalışmada, veriler 42 öğretmenden demografik bilgi anketi ve sesli düşünme rehberiyle toplanmıştır. Nitel olarak elde edilen veriler alanyazındaki bilgi arama stratejilerine göre sayısallaştırılmıştır. Elde edilen verilere Mann Whitney U ve Kruskal Wallis testleri uygulanmıştır. Analizler sonucunda öğretmenlerin bilgi arama stratejilerinin cinsiyet ve günlük internet kullanım düzeyi açılarından anlamlı farklılık göstermediği tespit edilmiştir. Çevrimiçi bilgi arama deneyimi açısından deneyimli ve deneyimsiz öğretmenlerin amaçlı düşünme bilgi arama stratejisi açısından anlamlı farklılık gösterdiği ortaya çıkmıştır. The purpose of this study is to determine the teacher’s online information searching strategies by the gender, daily internet use and expertise in information searching on the web. The data was collected through demographic information questionnarie and think aloud protocol from 42 teachers. Qualitative data were coded according to the frequency of information searching strategies in the literature. Mann Whitney U and Kruskal Wallis tests were used for analyzing study data. Analyses of the results showed that teachers’ information searching strategies had no differences between gender and daily internet use. Significant difference was found between expert and novice teachers in the purposeful thinking strategy. Aşkar, P. ve Mazman, S. G. (2013). Çevrimiçi Bilgi Arama Stratejileri Envanteri ’ nin Türkçeye Uyarlama Çalışması. Eğitim ve Bilim, 38(168), 167-181. Belkin, N., Cool, C., Stein, A., ve Theil, C. (1995). Cases, Scripts, and Information Seeking Strate- gies: On The Design of Interactive Information Retrieval Systems. Expert Systems with App- lications, 9(3), 379–395. Bilal, D. (2000). Children’s Use of the Yahooligans Web Search Engine. II. Cognitive, Physical And Affective Behaviors on Research Tasks. Journal of the American Society for Information Science & Technology, 51, 646–665. Bilal, D. (2001). Children’s Use of the Yahooligans Web Search Engine. I. Cognitive, Physical And Affective Behaviors on Fact-Based Tasks. Journal of the American Society for Information Science & Technology, 52(2), 118-137. Bilal, D. (2002). Children’s Use of the Yahooligans Web Search Engine. III. Cognitive And Physi- cal Behaviors on Fully Self-Generated Tasks. Journal of the American Society for Information Science & Technology, 53(13), 1170-1183. Brand-Gruwel, S., Wopereis, I., ve Vermetten, Y. (2005). Information Problem Solving by Experts and Novices — Analysis of a Complex Cognitive Skill. Computers in Human Behavior, 21(3), 487−508. Brand-Gruwel S., Wopereis I., ve Walraven, A. A. (2009). A Descriptive Model of Information Problem Solving While Using Internet. Computers & Education, 53, 1207-17. Burke, J. ve Christensen, L. (2004). Educational Research Quantitative, Qualitative and Mixed Approach (2nd edition). London: Pearson. Cohen, L., Manion, L., ve Morrison, K. (2007). Research methods in education. (6th Edt.). London: Routledge. Creswell, J.W. (2007). Qualitative Inquiry and Research Design: Choosing Among Five Traditions (2nd Ed). London: Sage. Ersoy, A. ve Türkkan, B. (2009). İlköğretim Öğrencilerinin Resimlerinde Internet Algısı. İlköğretim Online, 8(1), 57-73. Ersoy, A. ve Yaşar, Y. (2003). İlköğretim 4. ve 5. Sınıf Öğrencilerinin Internet Kullanma Durumları. Türk Eğitim Bilimleri Dergisi, 1(4), 401-424. Fraenkel, J. R. ve Norman Wallen (2009). How to Design and Evaluate Research in Education. New York: McGraw-Hill. Gong, S. H. ve Jiao, J. L. (2002). Diffusion of Innovations and Teachers’ Information Literacy. Educational Development & Research, 7, 64-7. Hargittai, E. (2002a). Beyond Logs and Surveys: In-Depth Measures Of People’s Web Use Skills. Journal of the American Society for Information Science and Technology Perspectives, 53, 1239-1244. Hargittai, E. (2002b). Second-level Digital Divide: Diﬀerences in People’s Online Skills. First Mon- day, 7(4). He, R. G. ve Lan, Y. (2000). Teachers’ Information Literacy for the Application of Computers in the Classroom. Journal of Information and Education, 77, 22-8. Hölscher, C. ve Strube, G. (2000). Web Search Behavior of Internet Experts And Newbies. Compu- ter Networks, 33(1-6), 337–346. Johnson, B. ve Christensen, L. (2004). Educational Research: Quantitative, Qualitative, and Mixed Approaches (2. baskı). NY: Pearson/Allyn & Bacon. Large, A., Beheshti, J., ve Rahman, T. (2002). Gender Differences in Collaborative Web Searching Behavi- or: An Elementary School Study. Information Processing & Management, 38(3), 427–443. Lazonder, A. W., Biemans, H. J. A., ve Wopereis, I. G. J. H. (2000). Differences Between Novice and Experienced Users in Searching Information on the World Wide Web. Journal of the Ame- rican Society for Information Science, 51(6), 576–581. Li, N. ve Kirkup, G. (2007). Gender and Cultural Differences in Internet Use: A study of China and the UK. Computers and Education, 48(2), 301–317. McMillan, J. ve Schumacher, S. (2006). Research in Education: Evidence-based Inquiry. London: Pearson. Özcan, N. K. ve Buzlu, S. (2007). Internet Use and Its Relation With The Psychosocial Situation for a Sample of University Students. CyberPsychology & Behavior, 6(1),19-26. Palmquist, R. A., ve Kim, K. S. (2000). Cognitive Style and Online Database Search Experience As Predic- tors of Web Search Performance. Journal of the American Society for Information Science, 51, 558–566. Peterson, J. W. (2003). Netgen Youth’s Information Seeking Process: An Examination of Cognitive, Affective, and Physical Information Seeking Behaviors and Problem Solving Techniques. Un- published doctoral dissertation. University of North Texas. Rouet, J. F. (2003). What Was I Looking for? The Influence of Task Specificity and Prior Knowl- edge on Students’ Search Strategies In Hypertext. Interacting with Computers, 15, 409–428. Roy, M. ve Chi, M. T. H. (2003). Gender Differences in Patterns of Searching The Web. Journal of Educational Computing Research, 29(3), 335–348. Schumacher, P. ve Morahan-Martin, J. (2001). Gender, Internet and Computer Attitudes and Expe- riences. Computers in Human Behavior, 17(1), 95-110. Someren, M.W., Barnard, Y. F., ve Sandberg, J.A.C. (1994). A Practical Guide to Modelling Cogni- tive Processes. London: Academic Press. Şahin, A., Çermik, H., ve Doğan, B. (2010). Is It “Writing On Water” Or “Strike It Rich?” The Experiences of Prospective Teachers in Using Search Engines. Educational Sciences: Theory & Practice, 10(1), 535-546. Tabatabai, D. ve Shore, B.M. (2005). How Experts and Novices Search The Web. Library & Infor- mation Science, 27(2), 222-248. Thatcher, A. (2008). Web Search Strategies: The Influence of Web Experience and Task Type. Infor- mation Processing and Management, 44(3), 1308–1329. Tsai, M.-J. ve Tsai, C. C. (2003). Information Searching Strategies in Web-Based Science Learning: The Role of Internet Self-Efficacy. Innovations in Education and Teaching International, 40(1), 43–50. Tsai, M. J. (2009). Online Information Searching Strategy Inventory (OISSI): A Quick Version and a Complete Version. Computers & Education, 53, 473–483. Tu, Y.W., Shih, M. ve Tsai, C. C. (2008). Eighth Graders’ Web Searching Strategies and Outcomes: The Role of Task Types, Web Experiences and Epistemological Beliefs. Computers & Educa- tion, 51, 1142–1153. Walraven, A., Brand-Gruwel, A. ve Boshuizen, P. A. H. (2008). Information-problem Solving: A Review of Problems Students Encounter and Instructional Solutions. Computers in Human Behavior, 24(3), 623–648. Wu, Y.-T. ve Tsai, C. C. (2005). Information Commitments: Evaluative Standards and Information Searching Strategies in Web-Based Learning Environments. Journal of Computer Assisted Le- arning, 21, 374–385. Yıldırım, A. ve Şimşek, H. (2005). Sosyal Bilimlerde Nitel Araştırma Yöntemleri (5.baskı). Ankara: Seçkin Yayıncılık. ISNAD TURAN, Zeynep , REİSOĞLU, İlknur , ÖZÇELİK, Erol , GÖKTAŞ, Yüksel . "ÖĞRETMENLERİN ÇEVRİMİÇİ BİLGİ ARAMA STRATEJİLERİNİN FARKLI DEĞİŞKENLER AÇISINDAN İNCELENMESİ". 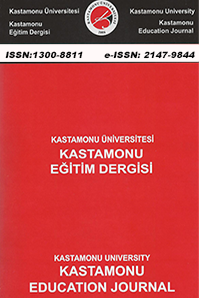 Kastamonu Eğitim Dergisi 23 / 1 (January 2015): 1-16.